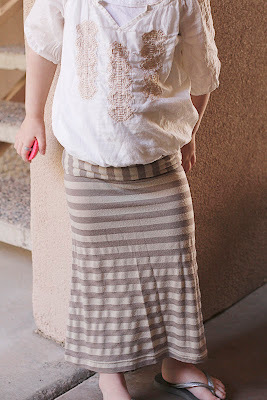 I am a huge fan of the comfort and ease of the maxi skirt. Not to mention the fact that I love the laid back style. I had this idea to attempt to make a "mini" sized maxi for my 2-year-old Indee, but I needed some guidance. 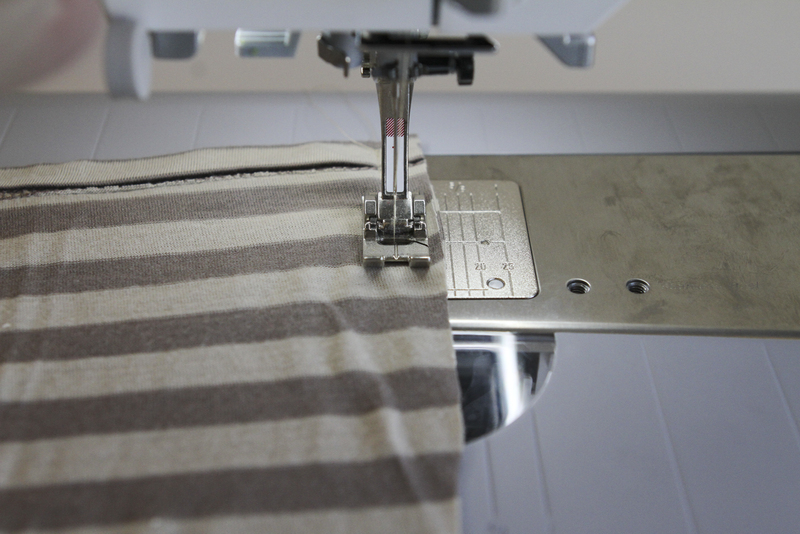 So I called on my good friend Sarah over at Made It Mine to help me bring this idea to fruition. 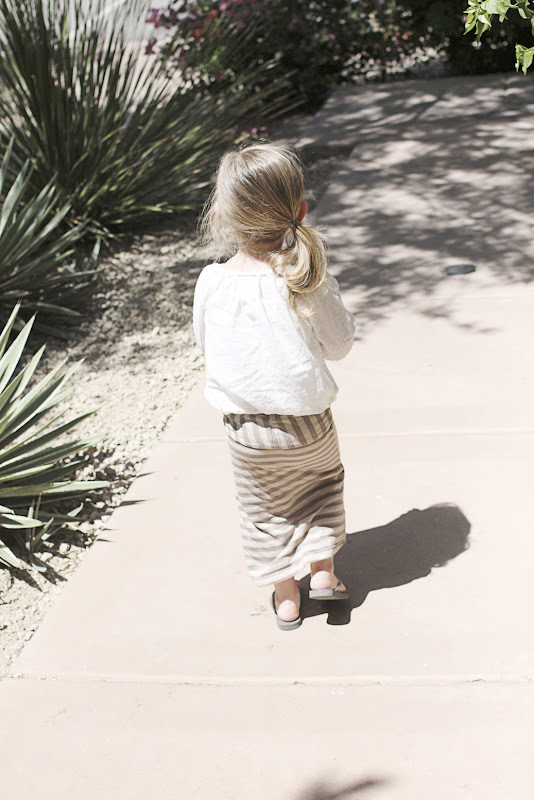 With Sarah's help I completed what would be the first of many maxi skirts for Indee. Once I got the hang of it, I pulled out an old t shirt I figured would look sooooo much more cute as a skirt on Indee, than it ever did as a shirt on me! 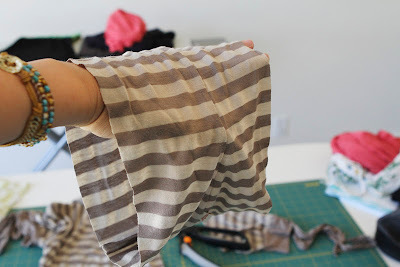 And let me preface folks, that if I can make this skirt, anybody can! So here we go! 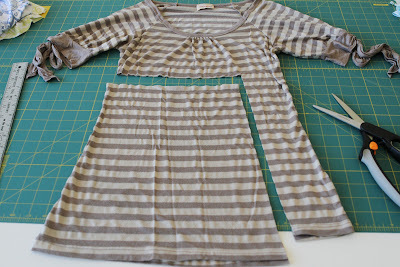 Next, take your measuring tape and measure around your little girls' waist. 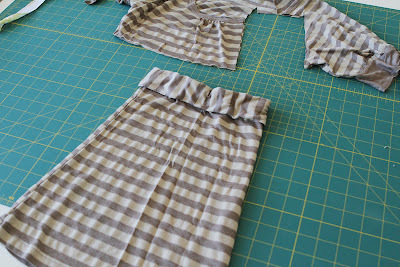 Then measure from her waist down to a point on her leg where you would like the hem of the skirt to hit. 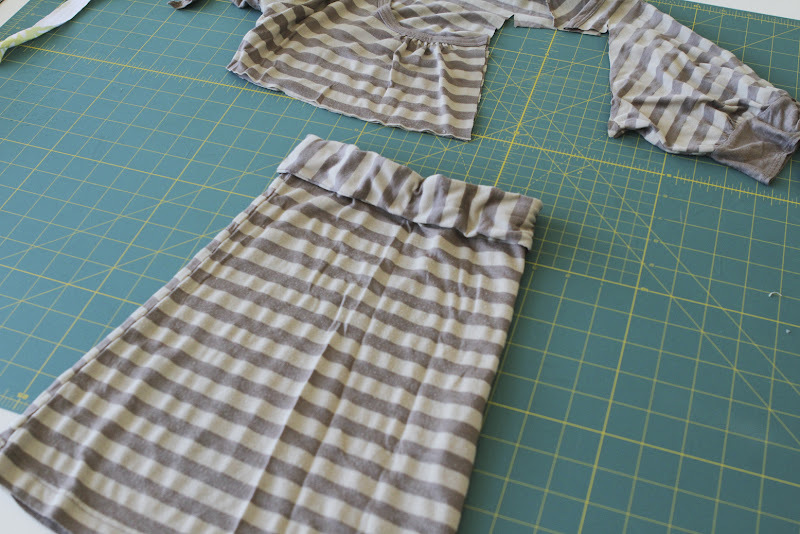 Next you need to divide her waist size in half for the front piece and back piece to the skirt. Example: Indee's waist is 18 1/2 inches. 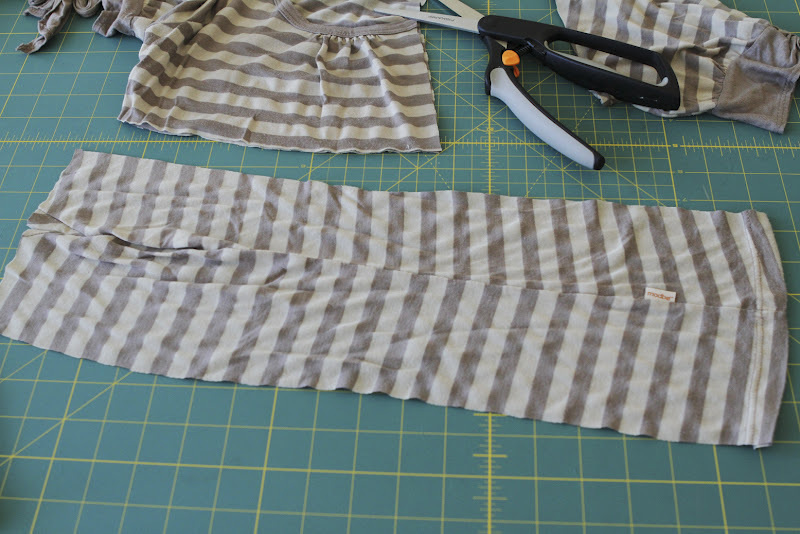 So I measured what would be the top(not the waistband) of the skirt width at roughly 9 1/2 inches. 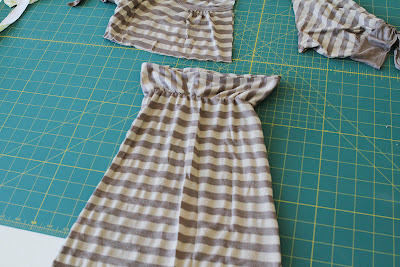 (front and back) Then I measured the length, wanting it to hit Indee just above her ankles. Example: 16 inches. Here is the cutout. 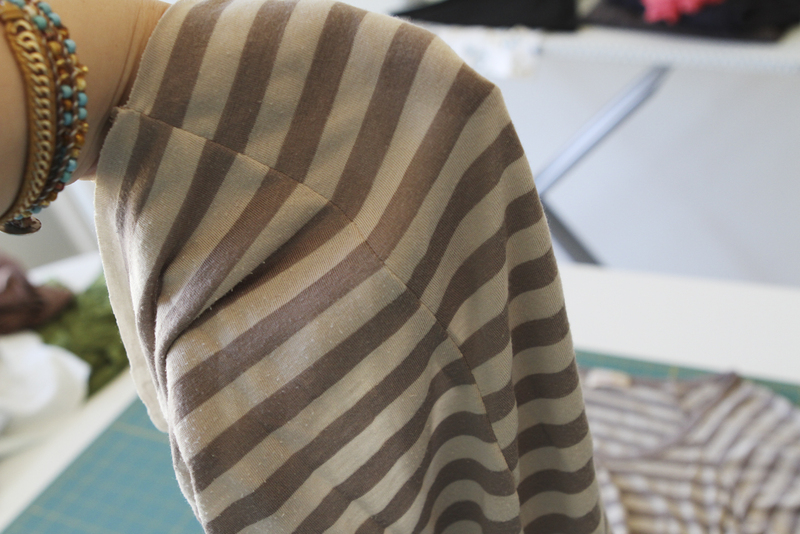 I used the already sewn side of the shirt as my guide for following the same slant in cutting the other side. So again, the measurement for Indee at the top is 9 1/2 inches front and back. And the new measurement at the bottom is 14 inches front and back. 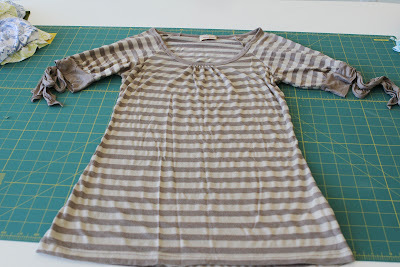 The nice thing about repurposing a shirt is the fact you already have a hem at the bottom and only one side to sew up! 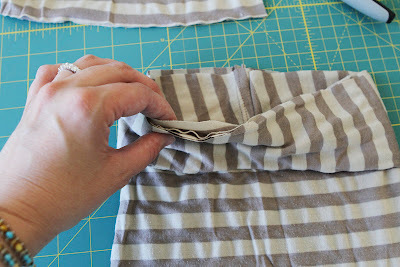 Now turn the cutout inside out and match up the open sides. Here I am sewing up the open side. 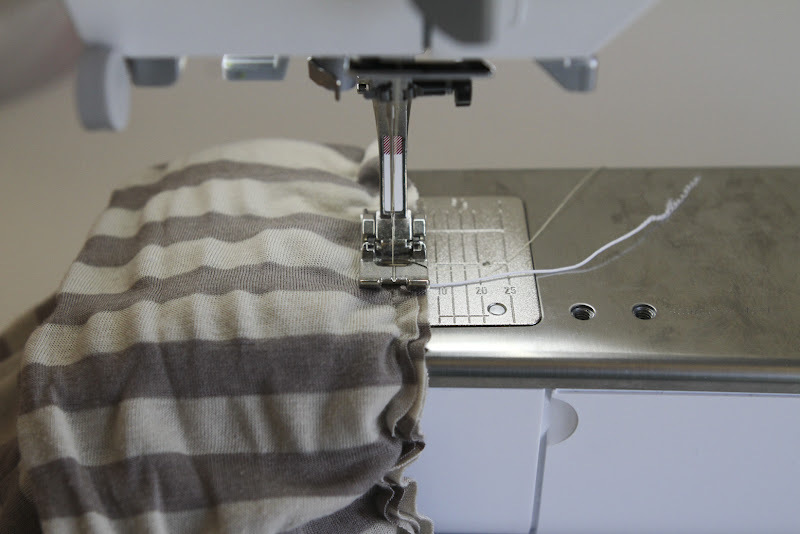 Make sure you backstitch at both ends. Now turn it back to right side out. 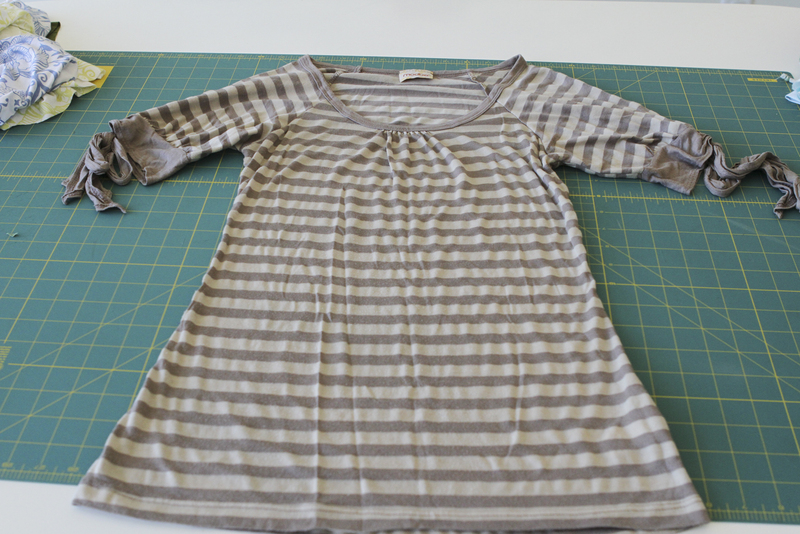 Here is the side a just sewed closed. 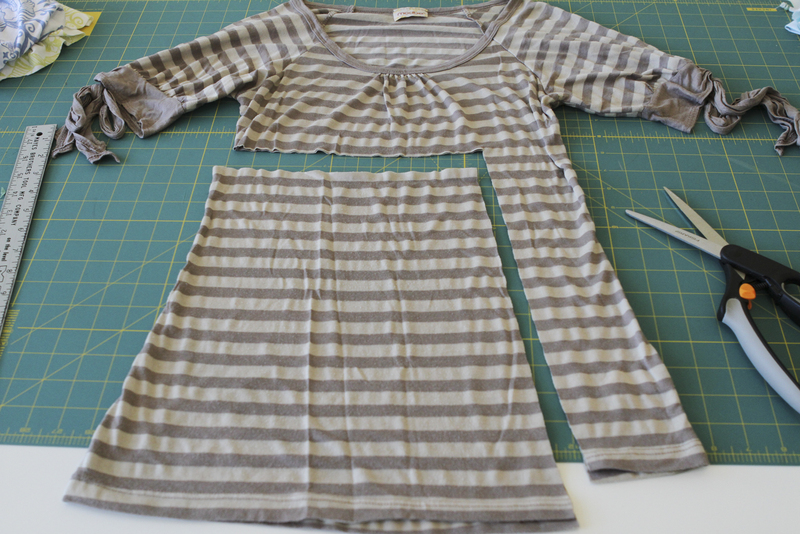 Next, cut your waist band. The thickness will just depend on how much shirt you have leftover. The length of the band should be slightly bigger than your little girls' waist. 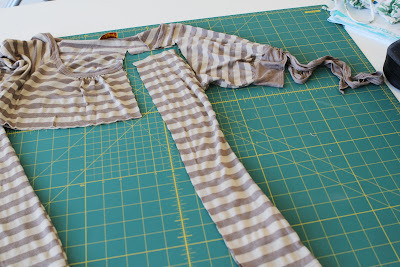 Example: I cut a 20 inch length for an 18 1/2 inch waist. 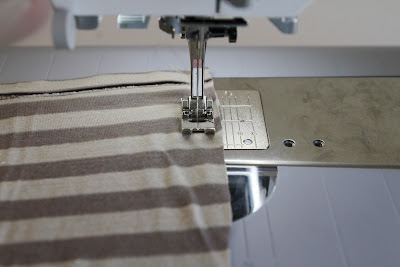 Now, lay it out flat, seam in the middle. 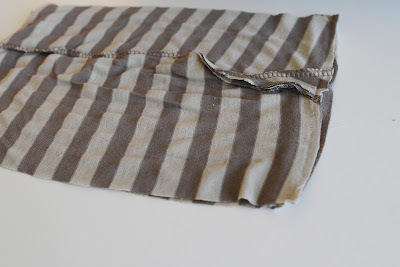 Fold it in half, inside facing out. Next, sew up the open side like I've done above. Sorry, you can't see it very well. Now, fold the waistband in half, open edges facing up. 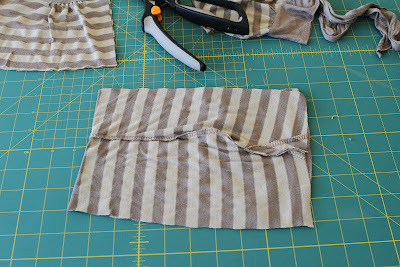 Put the top of the skirt inside the waistband, lining up all the raw edges. 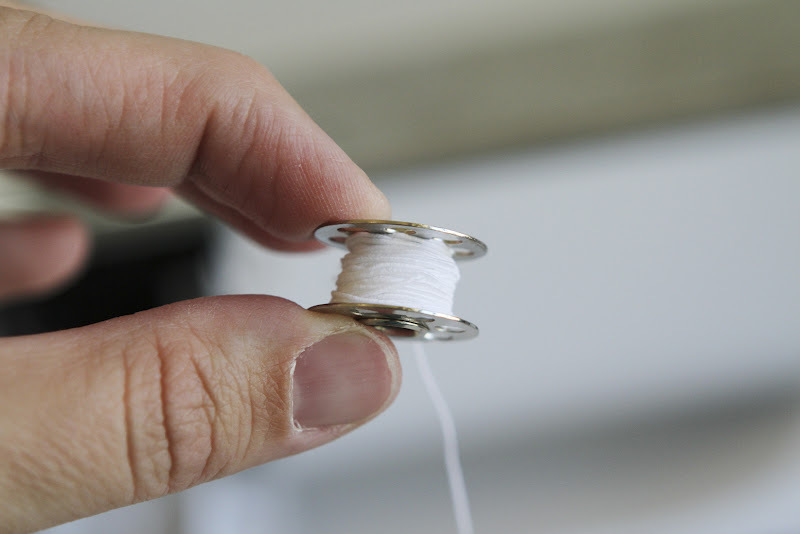 Wind a bobbin loosely with elastic thread and put in sewing machine. 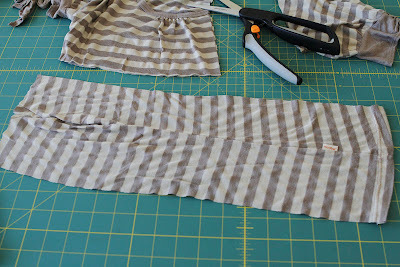 Sew the lined up raw edges of the top of the skirt and waistband together. Here is what it should look like after sewing the skirt and waistband together. 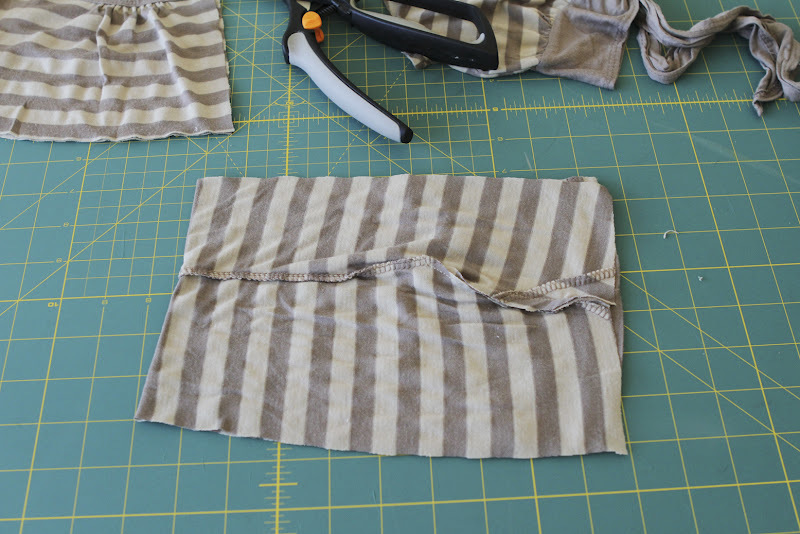 Waistband up. And with the waistband folded down. Here's the finished skirt on my sweet Indee Girl! I hope I've been clear enough. If you have questions, let's chat in the comments! Nice work! I love the stripe. Indee is so cute. Thanks Sister! It was fun to make! A.Maze.Ing. The next big thing. I swear. Indee's got the model bod down. :) So dang cute. 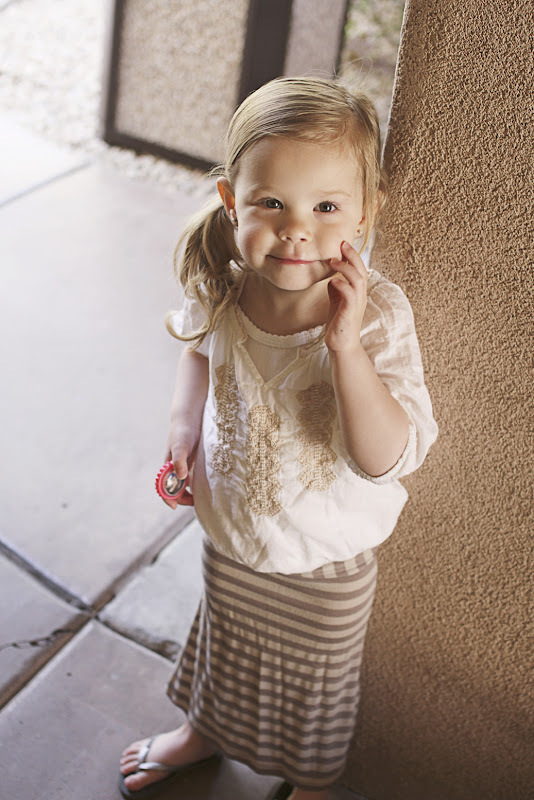 She looks SO cute Kara - I love the skirt!! i'm tucking this idea away for when Penelope is a little older. so cute!